Last Thursday we got confirmation that 21st Century Fox (NASDAQ: FOX) will sell the lion’s share of its assets to The Walt Disney Company (NYSE: DIS) in a deal valued at around $52.5 billion. By next June, and assuming all goes smoothly, Disney shareholders will own Fox’s famed film and TV production companies, along with a bunch of cable and international TV businesses such as the 39% stake (possibly 100%) in European pay-TV company Sky. In exchange, Fox shareholders will receive freshly minted Disney shares worth 100% of the total deal amount. In addition, right before the deal goes through, Fox shareholders will also receive shares in a spin-off company containing the local Fox TV stations, plus cable channels such as Fox News Channel, Fox Business Network, Fox Sports 1, and Big Ten Network. My first thought is that this is a pretty good deal for Fox. If you are a Fox shareholder then, under the terms of the agreement, you are set to receive 0.2745 shares in Disney for each share of Fox you own. That values the latter at around $30 each – roughly equal to where Fox shares were trading before rumors of a deal first started circulating. In addition you will receive shares in a new spin-off (‘SpinCo’) company containing those aforementioned assets that aren’t part of the Disney deal. Basically you get to swap out your Fox shares for Disney ones with ‘SpinCo’ thrown in as a kind of bonus. As for the latter’s value, Fox reckons ‘SpinCo’ will make $2.8 billion in earnings before interest, taxes, depreciation and amortization (EBITDA) based on 2017 figures. If my math is correct then that is worth roughly 35% of Fox’s current total earnings, so let’s call it somewhere in the region of $10 per Fox share based on the pre-rumor/pre-deal share price. All-in-all you’re therefore looking at a total deal value of around $40 per Fox share, or a roughly 33% premium to its pre-announcement share price. As for Disney shareholders, there’s probably a little bit more to digest here. First up, let’s take a look at that $52.5 billion price tag. Actually, after including the $13.7 billion worth of net debt that Disney will take on from Fox’s balance sheet, it’s more likely to be around $66 billion. If we look exclusively at ‘RemainCo’ – i.e. the portion of Fox that Disney is acquiring – then Disney expects the deal to add around $4.7 billion in annual EBITDA. Net out the $10 billion valuation of Fox’s stake in Sky, and you’re left with a total deal valuation that is somewhere around 12x current annual EBITDA. On the face of it that looks like a rich multiple, albeit with a few caveats. Firstly, we are still in a period of historically high valuations. Indeed Disney stock’s current valuation is around 11.5x annual EBITDA. Secondly, it nearly always requires some premium to get a deal done in any case. Finally, Disney reckons it can make $2 billion a year in cost savings and synergies due to the obvious overlap between two similar sets of assets. According to the company this would reduce the deal value to around 8.5x EBITDA. Overall I guess you could say it falls somewhere in the middle: neither too expensive, nor stunningly cheap. As for the future new-look Disney, there are a few things that stand out in particular. Firstly, the sheer scale of intellectual property that Disney will own is almost scary. I mean Disney shareholders were already sitting pretty with top franchises/assets such as Star Wars, Marvel and Pixar. Now they get to add stuff like Avatar and X-Men to that list too. We’re talking new films – e.g. plenty of new crossover material between various movie franchises – plus everything that usually goes with it when Disney is involved (theme parks, merchandise, and so on). Now in the past Disney has been the master at squeezing every last red cent out of its intangible assets, pretty much to the degree that the original deals look absurdly cheap in hindsight (e.g. Marvel and Star Wars). 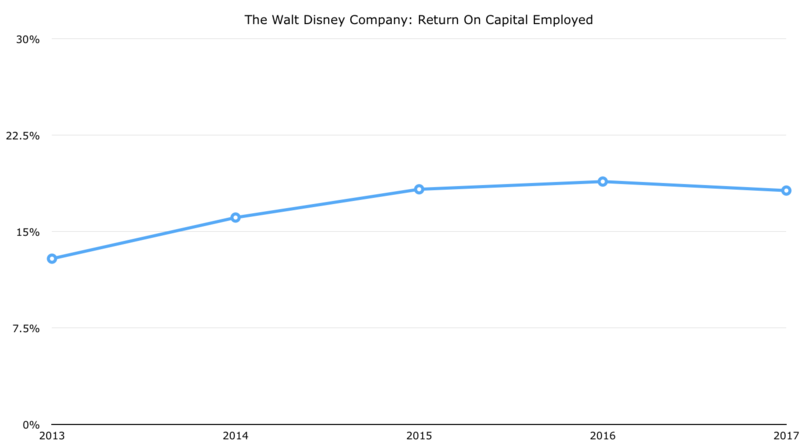 Incidentally if you want to see what that looks like in practice then just check out how much Disney makes per dollar of invested capital. Let’s see if it can make that 8.5x EBITDA look a steal in ten or so years time. Secondly, it looks as though Disney is doubling down big time on live sports. If this deal goes through then we’re looking at a whole bunch of new sports related assets, including Fox’s US Regional Sports Networks, Fox Deportes in Latin America, and Sky Sports which is dominant in a number of European markets. Now, in the past I’ve not been too keen on Disney’s continued ownership of national sports broadcaster ESPN. The main reason for that is because it represents the opposite end of the intellectual property relationship mentioned above (i.e. broadcasting without ownership). In addition, ESPN has also seen total subscribers drop from over 100 million in 2011 to around 87 million today. My guess is, despite the recent issues with ESPN, Disney management believes that sports is sticky enough to generate attractive margins despite content cost inflation and fewer subscribers. That is probably a fair assumption. The likelihood is that the bulk of ESPNs lost subscribers are from households that never wanted to watch sports in any case. In the past these folks wouldn’t have had any choice, since ESPN would have just been part of the general cable TV package. These days they can pick and choose whether to watch scripted content via a much cheaper streaming service such as Netflix. Given that ESPN’s subscriber fees – that is the amount that cable and satellite providers pay ESPN per subscriber – are as high as ever, then you can reasonably assume that live sports is actually one of the strongest bastions of the traditional TV model. If my viewing habits are anything to go by then I’d say that is a fair assumption. The final point I’d make is about the streaming ‘threat’ in general. Many commentators will frame this deal as some kind of response to the growing power of the likes of Netflix and Amazon. Google and Facebook are also looking to get in on the act in order to attract the lucrative advertisement dollars that previously went towards traditional TV viewing. In all these cases the central issue for these ‘upstarts’ is the cost of creating/licensing content. A cursory glance at Netflix’s cashflow statement will tell you that producing quality intellectual property doesn’t come cheap. Indeed those costs are currently dwarfing what the company generates in cash from its subscriptions. Given that post-deal Disney will have a virtually unparalleled content library in terms of size and quality, then I’d say it is much better placed than both its traditional media company peers and the upstarts in terms of earnings power. Granted it remains to be seen if streaming can ever be as profitable as the traditional TV model, but either way Disney will remain the pick of the bunch for a long time yet.